Things are looking up for the nation’s cities. 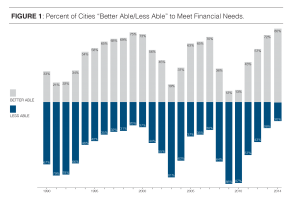 In 2014, the nation’s city finance officers report that fiscal conditions are improving as the Great Recession recedes.1 That’s according to a new report, released this week by the National League of Cities. The annual City Fiscal Conditions Survey revealed that local governments are slowly bouncing back from the shattering impact of the recession but still face significant challenges. “While tax revenues continue to improve, increases in service costs, long-term infrastructure needs, employee wages, and pension and healthcare obligations, along with decreased levels of state and federal aid, continue to constrain the fiscal outlook” the report notes. More city finance officers report improved conditions this year than in the 29-year history of the survey, with 80 percent reporting that their cities are better able to meet fiscal needs than in 2013. For the first time since 2008, more cities are increasing rather than decreasing the size of municipal workforces. As finance officers look to the close of 2014, general fund revenues are projected to stagnate and expenditures are projected to slightly increase.